The White House is telling US agencies to create "insider threat" programmes to ferret out disgruntled workers who may leak state secrets, reports say. 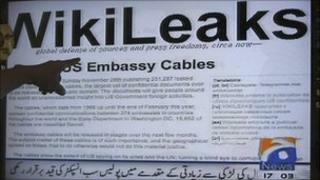 The move follows the leaking of thousands of secret US cables to the whistle-blowing website Wikileaks. An 11-page memo by US intelligence officials detailing the advice has been published by US broadcaster NBC. Correspondents say the Obama administration is trying to prevent more embarrassing disclosures. Agency officials are being urged to find ways to "detect behavioural changes" among those employees who might have access to secret documents. The memo suggests the use of psychiatrists and sociologists to measure the "relative happiness" of workers or their "despondence and grumpiness" as a way to assess their trustworthiness. The document published by NBC has been distributed by Jacob J Lew, director of the White House Office of Management and Budget. It was sent this week to senior officials at all agencies using classified material. The US is currently holding soldier Pte Bradley Manning on suspicion of stealing classified documents and passing them to Wikileaks. US officials have not commented on the memo published by NBC. The memo asks: "Do you have an insider threat programme or the foundation for such a programme?" It also asks whether agencies are using lie-detector tests or are trying to identify "unusually high occurrences of foreign travel, contacts or foreign preference" by members of staff. Wikileaks and its founder Julian Assange have faced strong criticism for releasing thousands of cables between the US State Department and diplomatic outposts around the world.